Are you stuck in the three-putt rut? It’s not the least bit uncommon for golfers of all skill levels to routinely take three strokes to sink a putt they should be able to make in two. Getting past this habit takes a change in mentality and a lot of practice. 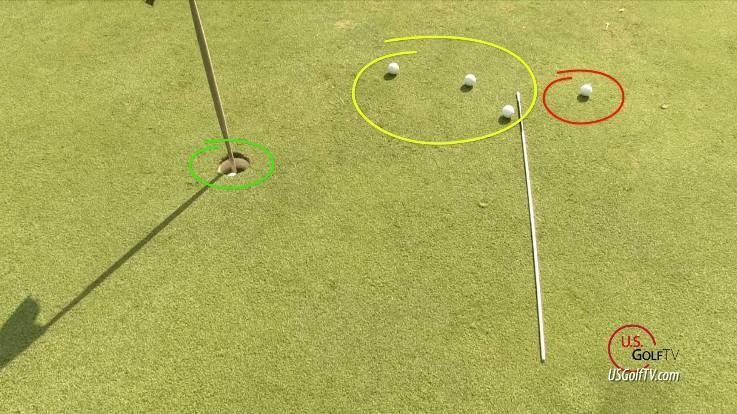 I’m going to share three drills that will help you develop the skills you need to avoid that frustrating three-putt. But first, let’s make sure we’re clear on some putting fundamentals. Before you can work on reducing the number of putts you take on the green, you need to master two basic concepts. First, you need to know proper putting setup. There are five key elements to the ideal setup, and if you’re not clear on what those elements are, here’s a video that will guide you through them. You also need good face control before diving into these drills. Your ability to deliver a square clubface at the moment of impact is essential to mastering the putt, and if you don’t feel confident in this area, this video introduces a few drills that will help you sharpen this necessary skill in no time. Once you know proper putting setup and have good face control, you are ready to work on avoiding the dreaded three-putt. As you probably know, your mentality as you approach the golf ball influences the way you play. That’s why it’s important to set the right expectations when you prepare to make your putt. We’ve collected data from several hundred rounds of golf played by tour professionals, top level college players, and even some of the best high school amateur players. What we’ve learned is that everyone, including tour professionals, do well to sink about 50% of their putts from a distance of 5-9 feet. Once that distance increases to a range of 15-25 feet, however, the average weekend golfer is much likelier to three-putt than one-putt. For a tour professional, that break happens at a distance of about 25 feet. Why does that matter? It all comes down to frame of mind. Many golfers are inclined to approach any putt with the goal of getting the ball in the hole. However, if you approach a 20-foot putt with the knowledge that you’re unlikely to sink it, you can focus instead on lagging the putt – getting the ball close to the target so you can finish the hole in two putts rather than three. In order to do that, you need to learn how to read the green and a few other skills. The following drills will help. I love working with an elevated string line for a number of reasons. It’s easy to set up, it doesn’t leave a mark (as chalk lines do), and it’s easy to move, which will serve you well in this particular drill. 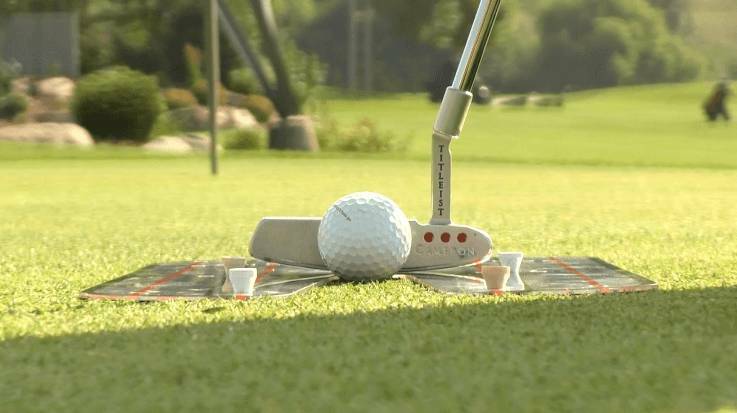 Now, you may have already used a string line to drill straight putts. That kind of practice is valuable for learning face control and precision. 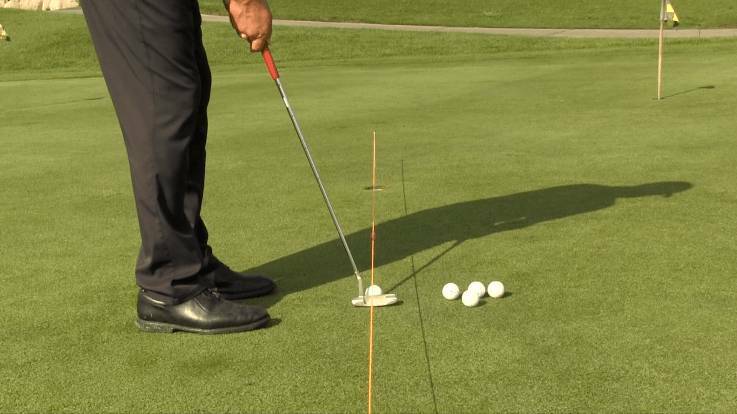 However, the Elevated String Line Drill takes your putting one step further by helping you prepare for the uneven surfaces you have to work with out on the golf course. Practice this drill on a putt that has a break. There should be a subtle slope on the green, causing the ball to veer left or right while rolling. 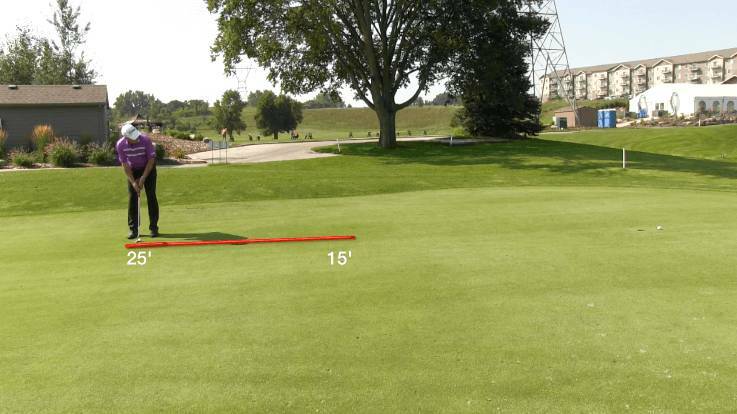 Place your ball about 15-20 feet from the hole and set up the string line so it serves as a visual path for your ball. Remember that the ball is going to break. So don’t set up the line so it leads directly to the hole. Set the line along the path you think the ball should take. Base this on your expectations of when, where, and to what degree the ball will break away from the path. For example, if you expect the ball to break to the left, set up the string line as far to the right of the hole as you think it needs to be to compensate for that break. 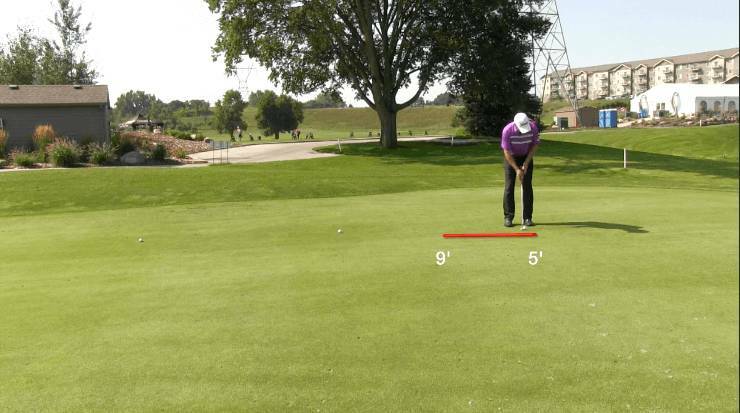 This drill not only tests your ability to read the green, it also provides you with a clear visual of exactly how you may have misjudged the terrain. The more you practice and correct any errors, the better you’ll be at making sure a runaway putt doesn’t hurt your scorecard. The Mirror Drill is similar to the Elevated String Line Drill in that the goal, once again, is to practice your precision on a putt that breaks. 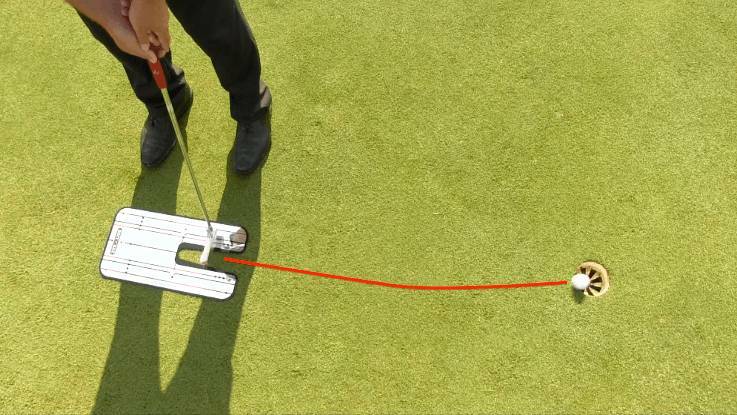 The Mirror Drill, however, is designed for practicing short distance putts. In other words, this is the drill that helps you avoid losing your mind by missing a three-foot putt due to an unexpected break. If you don’t already have an alignment mirror, I recommend the Golf Putting Alignment Mirror made by EyeLine. The mirror reflects your own setup and stroke back to you so you check your positioning, alignment, and eyeline. As with the String Line Drill, use this exercise to work on a putt that breaks, positioning the mirror at an angle to compensate for the break. 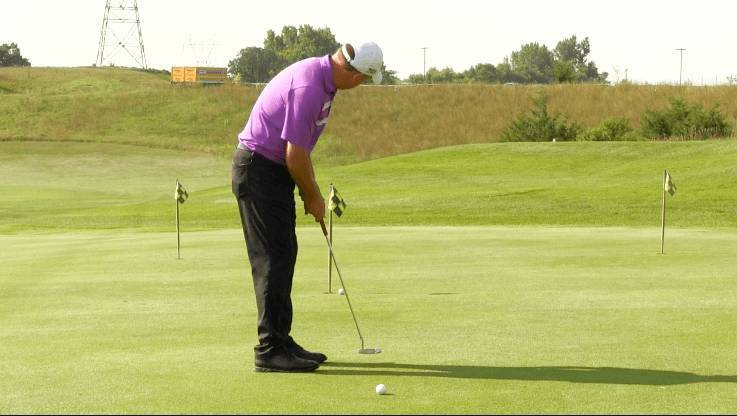 Short putts with break can happen often, but are not practiced often. 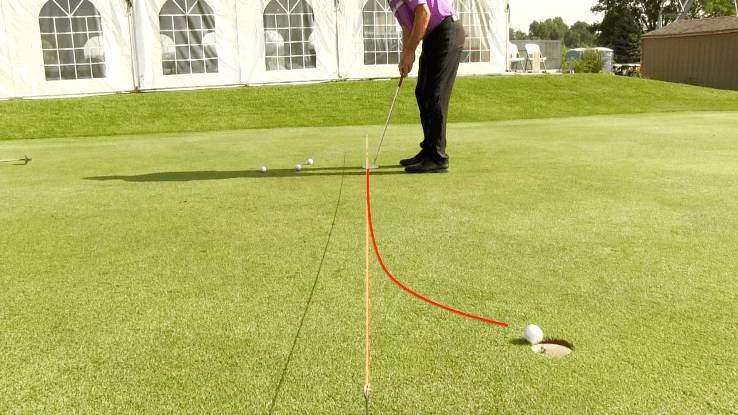 This drill helps you gain confidence on reading short putts as well. The No-Mark Drill helps you practice lagging from that 15-25-foot distance. As I mentioned, this is the range at which the average golfer is likely to wind up three-putting. Your goal in this drill is to get close enough to the hole to not have to mark your ball. To run this drill, take five big steps away from the hole. Place the first ball on the ground here. This puts your first ball at about 15 feet from the target. Take another big step and place another ball. Repeat this process, placing each ball one step away from the previous ball. Continue until you have placed five balls in a row. You now have balls placed at approximately 15, 18, 21, 24, and 27 feet from the hole. Starting with the first ball, putt each one towards the cup. The goal is getting the ball as close to the hole as possible. The fewer balls you’d have to mark for the second putt, the better you’re doing. A good goal for an average golfer would be three unmarked balls. To add a helpful visual to this drill, lay an alignment rod behind the hole. You want it about one rod’s length away from the hole with the long side facing you. When you putt, try to land the ball somewhere in front of the alignment rod. If the ball is against or beyond the rod, it’s gone too far. 1 ball in, 3 balls close enough to not be marked, 1 ball to mark. Set your mentality for lagging those long-distance putts. These small shifts in perspective will have a significant impact on your ability to turn those three-putt holes into two-putt holes. Once you’ve had a chance to try these drills, come back and let us know if they worked for you. If you have any questions, disagreements, or suggestions of your own, let us know in the comments. We love hearing from you and we love talking golf! Take your game to the next level and find Your Tour Precision!